When it comes to plays by Shakespeare, “Oldcastle” is not a name that is familiar to us–or at least, it is not familiar in the way “Hamlet,” “Othello,” and “Falstaff” are. But it might have been. 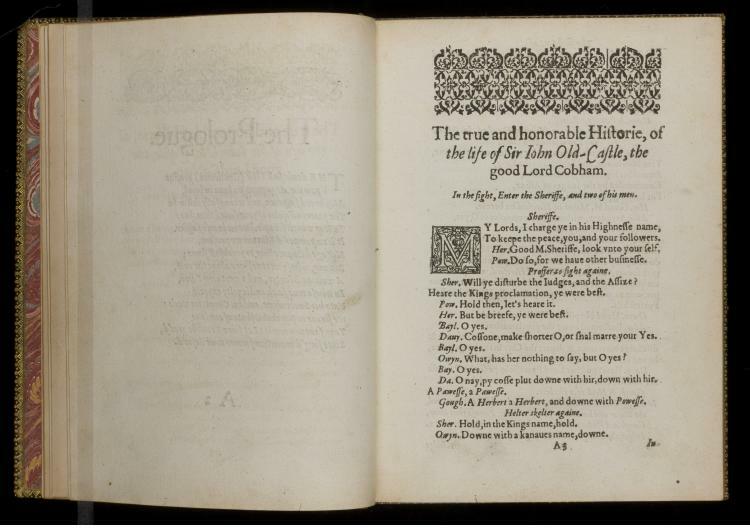 In his earliest dramatic iterations, Shakespeare’s grandly comic companion to Prince Hal, John Falstaff, enjoyed a more venerable title: Sir John Oldcastle. The name had a storied history, running deep through the channels of England’s Protestant origins, thanks largely to the efforts of John Foxe, a sixteenth-century Protestant historian who took it upon himself to compose a canon of England’s great Protestant martyrs, the Book of Martyrs. 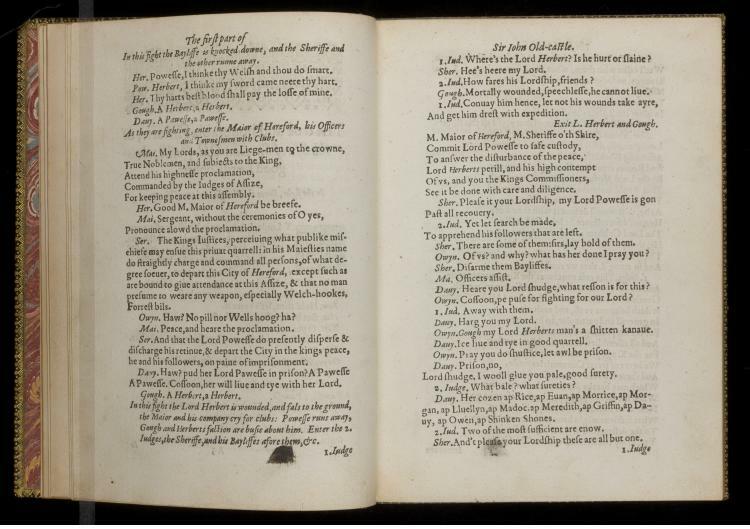 Foxe’s Book of Martyrs offered a fiery national alternative to the Catholic canon of saints which England was in the messy process of shrugging off, and in its many pages was chronicled the unhappy rebellion of a knight named John Oldcastle. Oldcastle was one of the Lollards, a group of fifteenth-century religious dissenters, and his resistance led to his hanging an burning in 1417. Leaving Falstaff where? 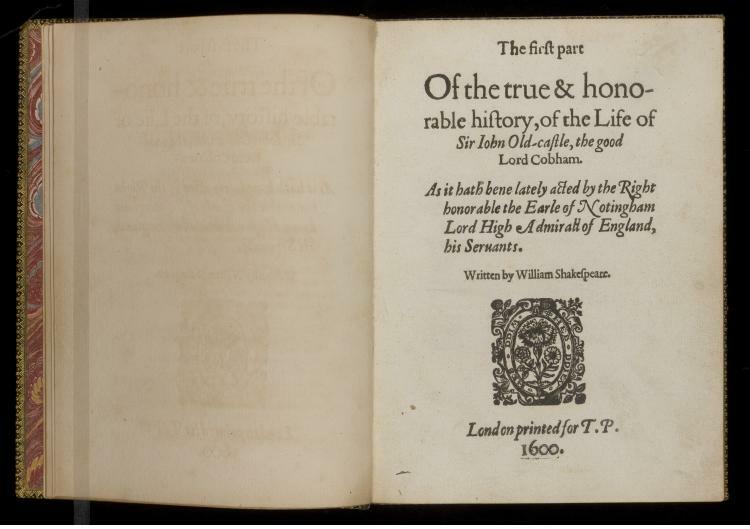 As Foxe has it, the story of Sir Oldcastle is one of protest and purpose, of the sacred honors to be gained from combating a doctrinally corrupt regime. The story of Falstaff is of a different mold: “What is honour?,” the unlikely knight asks with his signature mix of skepticism and play. 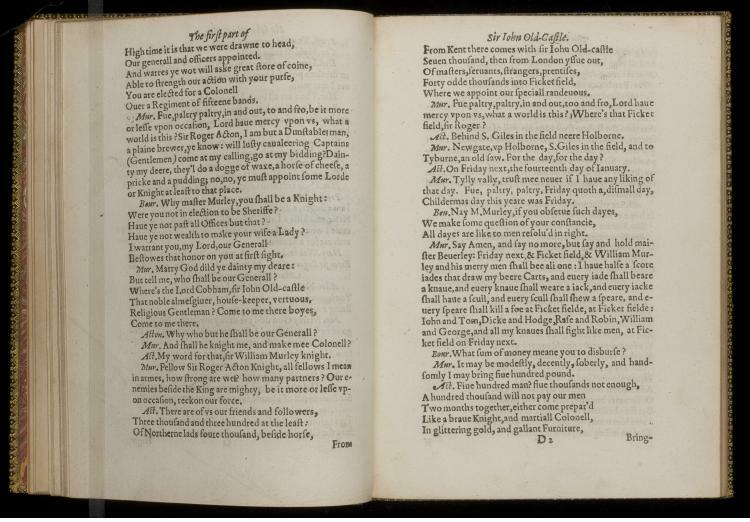 But Falstaff had, first, another name, and that name was John Oldcastle–a choice which makes Shakespeare’s dramatic rendition of the martyr-knight more than a little flippant. So provocative was the character, in fact, that the ennobled descendents of the Oldcastle line requested his name be changed. They were appeased. “Oldcastle” was traded “Falstaff,” a name of far safer political baggage, since there were no sixteenth-century Falstaffs to take umbrage with Shakespeare’s portrayal–but the cost, for us, is that we lose something of the full range and context of Falstaff’s subversive humor. 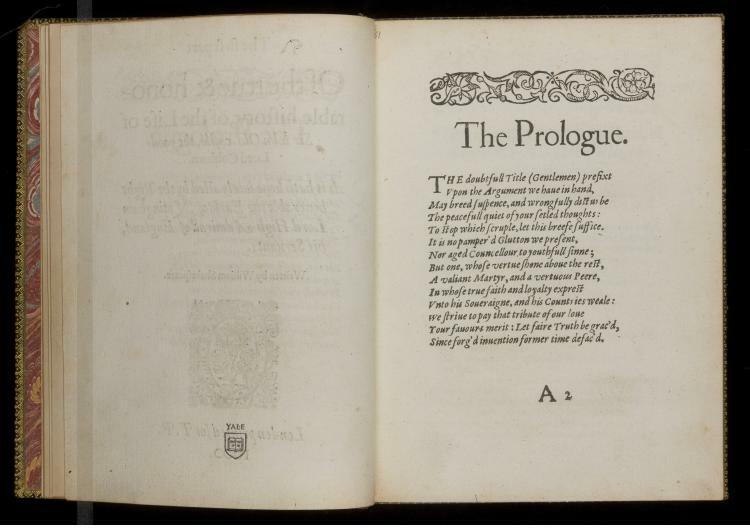 Like other Pavier quartos featured so far, this edition advertises a 1600 printing date; unlike Midsummer and The Merchant, though, the Pavier quarto of Oldcastle declares itself to have been printed for “T.P.,” the Thomas Pavier, presumably, at the heart of the uncollected collection.